Now you can have a balanced performance ignition system that is designed to make the most horsepower without mixing and matching components. 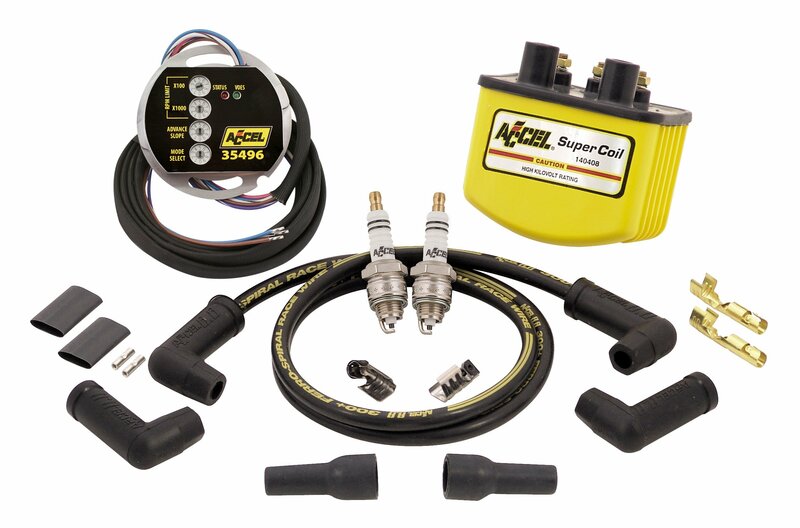 The ACCEL Motorcycle ignition system is a complete bolt-on system that is designed to work together to produce an adjustable ignition that out-performs others. The ignition system includes the adjustable ignition module, the new Single Fire Super Coil, ACCEL high performance U-Groove spark plugs, and ACCEL black 8.8 performance spark plug wires. They can be installed easily and adjusted simply by switches on the module to produce the performance to match your machine.